Liberty, Mystery, Veracity and honesty. – Dirty wet dog , boats and sailing. Liberty, Mystery, Veracity and honesty. Down at the yard today and it was a good and sunny one but cool in the easterly breeze : so tempting though to throw off the lines and head downriver on the tide, only the fact of having to be at work in the morning stopped me. I really like the 3 boats alongside the wall here, ok so the first one is mine (Liberty) but the other 2 get a lot of interest too, not just from the boat owners but the many ‘day-out-ers’ that pass through the yard : just to add that Chris and Julia positively encourage visitors to the yard and many have heard of Pete Goss and his lugger even if most of them refer to it as an old gaffer….its only a few years old. The liberty (WABI”’) is of course my own boat and a bit out of place with the 2 heavy classic luggers, i guess the connection is that all 3 have a couple of rigs each and are fundamentally simple and seaworthy boats. Spirit of Mystery is of course the big lugger that local hero Pete Goss had built and then sailed down to Australia via the roaring forties : although a good tough boat its not one that i would chose for the southern ocean but hey he’s an adventurous sort. 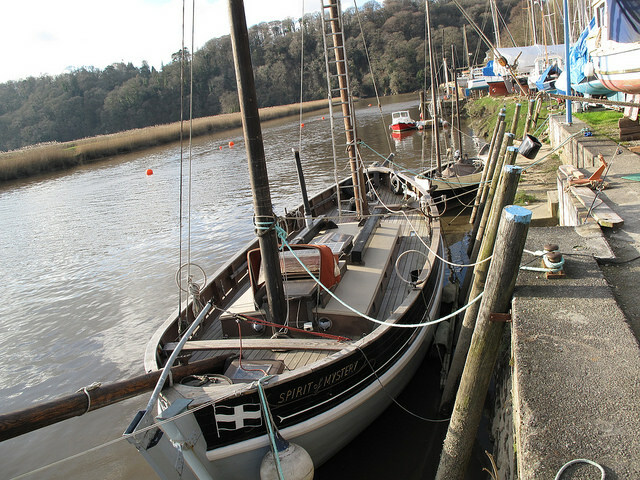 Its now owned by Chris and Julia who run the yard and i believe the plan is to sail her at the classic boat regatta’s down here in the south-west. She is i believe 38 feet plus a long boomkin currently overhanging my little cockpit and which we are going to use to help sling my new battery aboard. She is a solid looking boat based on a west country fishing lugger, i am told 12 tons displacement and 3 feet draught forward 6 aft. Right now the yards are down for sanding and oiling and Chris is getting on with her spring fit-out. Astern of Mystery is ‘Veracity’ which is a much smaller lugger of about 21 feet and apparently built down at the Falmouth boatbuilding school. She is mostly an open boat although i believe that she is to be fitted with a cover so that she can be camped aboard. Chris and Julia must really like Luggers because this is their ‘other’ boat, kind of wonder if they have car stickers with the legend “my other boat is a lugger”. Honesty here is the excellent cafe in the yard : basically a help yourself and pay to tea/coffee and most excellently made cakes. Seems to work, it certainly brings people into the yard even if some of them are a bit on the pretentiously irritating kind…i guess it helps that some of them get to hear some ‘salty’ language when i drop yet another tool in the mud. Possibly the nicest boatyard that i have ever kept a boat at, i almost need a second boat so that i can have one here when i leave for my voyage.